(Phys.org) —What better place to use the "new vintage" computing theme than in Napa Valley where the Cray User Group meeting took place on Tuesday, The tie-in this year is Cray's new vintage of supercomputers for a business segment that Cray calls the "technical enterprise." In brief, Cray has seen an opportunity to accommodate the need for complex computing simulations of supercomputers but engineered (in the form of economized packaging, networking, cooling and power options) at a price that businesses can entertain. Cray used the Tuesday event to announce a lower-priced version of a Cray XC30 system, for business customers. The new supercomputer is the XC30-AC, shipping with Intel Xeon processors, which will sell as a low-cost model priced from $500,000 on up. For those who follow supercomputers, Cray needs no introduction, recognized in terms of petaflops and world titles for fast supercomputers, not to mention as the builders of the $60 million Titan, built at the Oak Ridge National Laboratory. Cray now has a package of supercomputing features for business customers who have a continued demand for supercomputing features to carry out their technical work. Peg Williams, the senior vice president of high performance computing systems at Cray said that "With all of the features and functionality of our high-end Cray XC30 systems, our new Cray XC30-AC supercomputer is perfectly suited for technical enterprise customers, giving them the ability to leverage all of the world-class computational resources of a Cray supercomputer at much lower starting price points." Some examples of what types of customers would go for such a system include businesses engaged in life sciences, financial services and energy. As for operating system, Cray said it is using the Cray Linux Environment, with components that include SUSE Linux SLES11. The XC30-AC system features an air-cooled, cabinet architecture. The "AC" indicates how the systems are air-cooled instead of water-cooled. Power requirements are eased up; the air-cooling approach is more amenable to data-center environments. Cary noted there are no requirements for liquid coolants. Air conditioners can replace a liquid cooling system. According to Cray, a single high-efficiency fan per cabinet blows bottom-to-top airflow to keep less densely populated configurations cool. Technical enterprise datacenters without raised floors or plumbing for liquid cooling systems may have different power requirements, and the Cray XC30-AC has options for 480V or 208V operations. 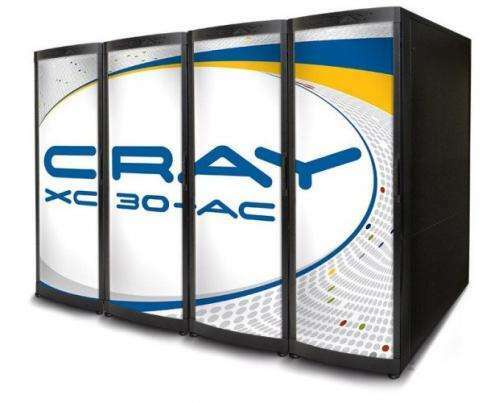 Although the XC30-AC was formally announced just Tuesday, Cray said they had already sold systems to customers that include "a global consumer electronics company and a global financial services company." And only a meagre 22TFlops per cabinet.